Hon. Vice Chancellor Prof. Dr. A. Ramachndran cut the ribbon to the new premises of NERCI at the Kerala University for Fisheries and Ocean Studies in Cochin. The Centre has been located for six years in a business centre in Ernakulam centre. These offices served the Centre well, and we made great memories there, but we are more excited about our new and spacious offices which is now housed in the Amenity centre of the academic institution KUFOS. The relocation will give the Centre new opportunities to extensive collaboration and interaction with the students and faculty of KUFOS as well as other academic institutions in India. Chairman of the NERCI Board Lasse H. Pettersson welcome the guests to the inauguration ceremony at the new premises of NERCI. 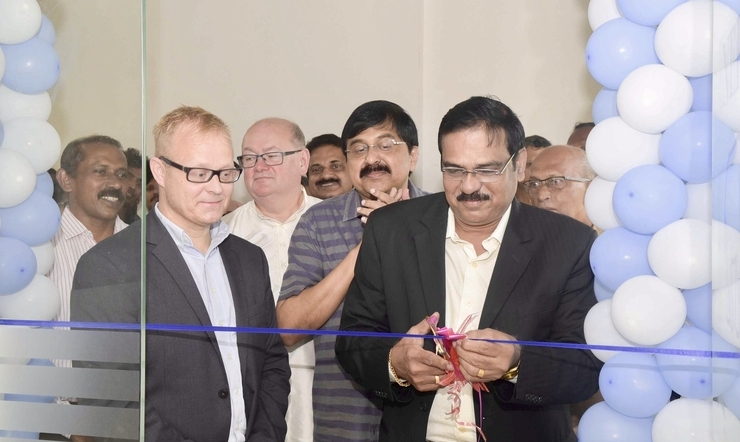 Nansen Environmental Research Centre, India, has organised the inaugural ceremony of the new premises on 7th November 2018. In the Inaugural Function, has graced the occasion as the Chief Guest while Dr. A. Gopalakrishnan, Director, Central Marine Fisheries Research Institute (CMFRI) and Dr. T. Pankajakshan, Scientist in Charge, National Institute of Oceanography (NIO), Kochi as the Guests of Honour. 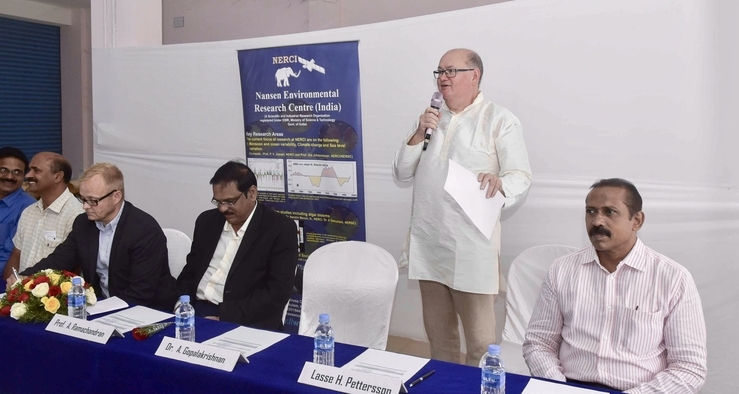 Welcoming the Chief Guest and other dignitaries, Mr. Lasse H. Pettersson, Chairman of the NERCI Board has acknowledged the efforts made by NERCI staff and collaborating institutes in the progress of NERCI in Indo-Norwegian and international research and educational cooperation. The Chairman of the NERCI Board Lasse H. Pettersson expressed during the welcome statement:- During these years NERCI have contributed to research cooperation particularly in ocean and atmospheric sciences, applied on monsoon studies, climate change and studies of the oceans and marine ecosystems. Also student training and recruitment through hosting several research schools on subjects that are relevant and sometimes very new to the participating students either here in Kerala or elsewhere in India. He concluded that: -The much of the research and educational network and cooperation of NERCI are focused on you here in Kerala, but it also goes beyond to other research institutions all over India. In the inaugural address the Hon. Vice-Chancellor pointed out long lasting association between KUFOS and NERCI and wished a whole hearted support for all its future endeavours. Attending the function as the Guest of Honour, Dr. A. Gopalakrishnan wished NERCI to strengthen and develop further associations with various research institutions in India. Dr. T. Pankajakshan of NIO congratulated NERCI for their achievements in Ocean science during the last almost 20 years since the foundation in 1999 and extended the research support for NERCI. Felicitations were delivered by Dr. Sebastain H. Merlind, Director, NERSC, Norway and Mr. Victor M. George, Registrar, KUFOS. The function ended up with ribbon cutting of the new premises by the Hon. Vice Chancellor. Vote of thanks was delivered by Dr. K. Ajith Joseph, Director of NERCI. Invited guests and the NERCI board and staff members gathered during the opening ceremony at Panangad.